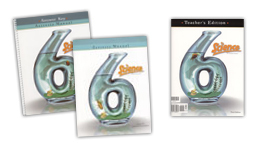 Sixth Grade Curriculum  - $613.00 : Covenant Home Curriculum - Providers of a complete, eclectic, classical approach, Pre-school through 12th grade curriculum for home educators with a reformed Christian world view., The World's Best Reformed, Comprehensive, Classical, Homeschool Curriculum, and School Administration Provider! Parents report that the Day-by-Day is an especially valuable friend in sixth grade. After all, children of this age are moving into the dialectic (logic) stage of the Trivium; they are now able to challenge the things they learn. Youa?Tll notice that our test sets contain more essays at this level, and writing is of increased importance. Students are asked not only to describe in their own words but to give pros and cons, to discuss behavior or express opinion. If a student is taught how to learn in a few subjects, he will be equipped to learn any subject! In Bible, students engage in a study of the New Testament focusing on the ministry of Christ and the first missionary journeys. In history, sixth graders read a passage and then summarize orally or in a notebook. Continual feedback and interaction of ideas not only ensures proper understanding but provides an opportunity for expression and growth. It builds confidence. The reading of Castle and Cathedral is integrated with the study of the Middle Ages. In vocabulary, students learn synonyms, antonyms, applications of words and analogies. 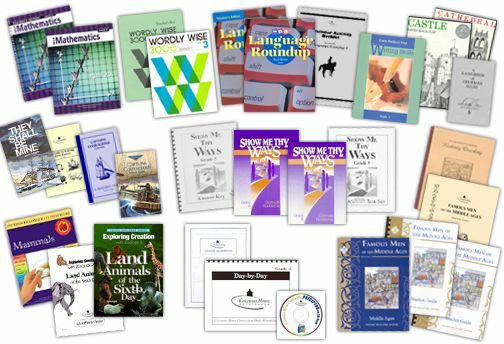 The Writing Skills workbook sets forth some basics of topic sentences and paragraphs, and Language Roundup 6 continues the study of grammar through the final book in the four-year series. Students will discover amazing animals, record where each one is found, and learn to identify tracks as part of the third book in the science series Exploring Creation with Zoology. The main focus in math is on division of decimals, geometry and percentages.